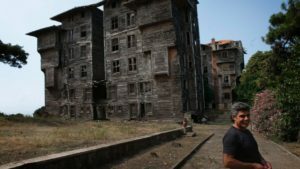 BUYUKADA ISLAND, Turkey – Each morning, Erol Baytas checks for further damage on the imposing but derelict timber building on an island off Istanbul that for decades housed orphans from the minority Greek community. The scene on the hilltop on the island of Buyukada, the largest of the nine Princes’ Islands in the Sea of Marmara, looks more like the shattered remains of a horror movie set than the majestic hotel and casino complex that it was originally intended to be. Parts of the roof have caved in, wooden panels are missing and the kitchen stoves have rusted. It’s quite a fall from grace for the 120-year-old building. “Every day, a piece of the building falls out,” laments Baytas, the building’s 56-year-old caretaker. The building over six floors was originally designed by architect Alexandre Vallaury for the Compagnie Internationale des Wagons-Lits, the company which also ran the famed Orient Express. But when it was built in 1899, Ottoman Sultan Abdul Hamid II withheld his permission for it to operate as a hotel and casino. 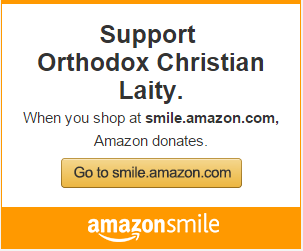 The wife of a Greek banker later purchased it and donated it to the Istanbul-based Ecumenical Patriarchate of Constantinople, which then ran it as an orphanage. The Prinkipo orphanage became home for about 5,800 minority Greek children from 1903 until 1964 when it was forced to shut down, a victim of political tensions between Turkey and Greece over the east Mediterranean island of Cyprus. The building later became the subject of a drawn-out legal battle between the Ecumenical Patriarchate and the Turkish government, which confiscated it in 1997. 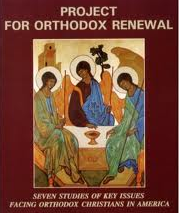 It was returned to the Patriarchate following a European Court of Human Rights ruling in 2010. Earlier this year, the cultural heritage organization, Europa Nostra, included it on a list of seven endangered monuments, but its fate remains unknown. The Patriarchate has said it wants it turned into an institute for environmental issue. A team from Europa Nostra and from the European Investment Bank Institute is expected to prepare a report on what needs to be done to save the building. The report will be ready by end of the year, according to the European Investment Bank Institute. Istanbul — once Constantinople, the capital of the Byzantine Empire that was dominated by the Orthodox Church — was captured by the Muslim Ottoman Turks in 1453. Istanbul’s Greek population has dwindled to less than 3,000 in recent years, but the Ecumenical Patriarchate, the seat of the spiritual leader of the world’s Orthodox Christians, remains in the city. Sitting under the shade by the St. Nicholas Orthodox church in Istanbul’s Yenikoy neighborhood, 80-year-old Vitleen Magulas still has vivid memories of Prinkipo, where she lived with her sister, from 1945 to 1951. “At night, when the moon came up, it was as if you could hug it. We had very beautiful nights there,” Magulas said. Baytas fears that the structure, which suffered a fire in 1980, may not survive another winter of neglect. Suzan Fraser reported from Ankara. Next Article An “Orthodox Vatican” in the works?